A trebuchet is a siege engine that was employed in the Middle Ages. A trebuchet is a type of catapult that works by using the energy of a raised counterweight to throw a projectile. It could fling projectiles of up to three hundred and fifty pounds (140 kg) at high speeds into enemy fortifications. 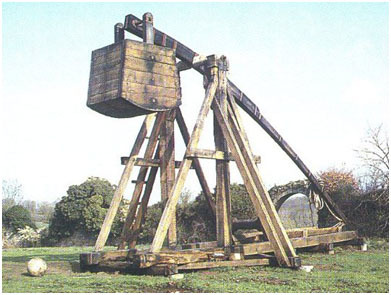 The trebuchet did not become obsolete until the 15th century, well after the introduction of gunpowder. I first saw a trebuchet on the old TV series Northern Exposure where the device hurled an upright piano across an Alaskan meadow. What kid or curmudgeon doesn’t have the need to fling something at an enemy fortification? I had to have one. My wish was fulfilled when I got one, in kit form, as a birthday present many years ago. I postponed and postponed its assembly until I ran out of excuses. People kept wondering why I was always busy rearranging my sock drawer when I have only two pairs – the one I’m wearing and the one in the drawer. I finally started assembly of my floating-arm trebuchet. I followed the instructions carefully but failed to get one critical component correct. As a result, when the floating arm dropped, I hurled my test ball the astonishing distance of about three inches – directly behind the machine! After considerable trial and error and a lot of cursing and sweat, I did get the contraption working with modest success. In moments of weakness, I devised a plot to capture a former unpleasant boss (my “imaginary boss” is named “Steve,” you can substitute your own) and tie him to the hurling end of a full size trebuchet of my own making.